This entry was posted on October 8, 2014 by admin. Desperate to survive, he began to look online - and found a YouTube video which described the use of cannabis oil as a cure. He claims that just three days after taking the class B drug, his excruciating pain disappeared. In May this year, the grandfather-of-nine went for a biopsy at the Royal Free Hospital in London. To his relief, doctors told him the new cancerous cells had vanished. A spokeswoman for the Royal Free Hospital confirmed Mr Cutler had not received any cancer treatment since his transplant in November 2009. Mr Cutler, a retired builder from Hastings, East Sussex, said: 'Finding out I could die was terrible. 'All I had in those dark days was my laptop, and that's when I began searching for something else that could help me - I couldn't accept I was going to die. He started taking cannabis after watching a video online about how it could help cure the disease. 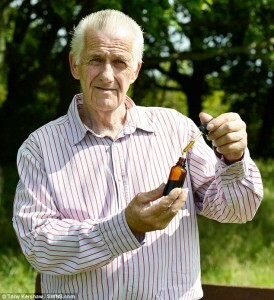 After purchasing the drug through a dealer, he began to cultivate his own tablets from the oil, taking one capsule a day. When his symptoms disappeared after three days, he began growing his own cannabis plant to keep up a steady supply of the medication. Mr Cutler was one of the speakers at an event last week about the medical use of cannabis - along with Professor David Nutt and MP Caroline Lucas at Brighton Community Centre. He is now campaigning for changes in the law to allow the oil and other forms of cannabis to be legally used medicinally to treat other people. Research published last week by scientists at the University of East Anglia found the main psychoactive ingredient in cannabis - Tetrahydrocannabinol or THC - has been shown to help combat the growth of cancerous cells. Dr Kat Arney, Cancer Research UK’s science communications manager, said: 'These experiments were done using cancer cells grown in the lab or in mice and the results help to unpick the details of how cannabinoids affect cancer cells at a molecular level. Cannabinoids help to control brain and nerve activity, energy metabolism, heart function, the immune system and even reproduction. As a result, a number of charities have intensified their research into the use of cannabis as a medical drug.